Does leadership development need boundaries or does it just happen organically within the organization? This question made me flounder for a bit, due to my thinking that people ought to be who they are and be able to develop on their terms vs. my System-Drive-Behavior thinking. As we spoke, I shared the 7 Principles for Leadership Development that were established when I constructed a corporations ‘Leadership University‘ along with their CEO, HR director, and staff from multiple departments. Sharing the leadership development principles to an organization that is looking to develop leaders internally with little to no outside assistance (i.e. consultants who do not know the internal politics and work) we began to see how each principle can work to support the progress of the organization. The necessary skills that are needed for managerial leaders to be able to complete their work, reproducing practices and procedures with the knowledge of the steps to complete the work and be able to articulate to others what procedures are followed. Why, who, what, how of identifying the people that will be involved in the leadership development. Knowing that those you exclude sends a stronger message than those you include. Choosing who and how they will come to have leadership accountability and whose work they will be accountable for is necessary for leadership development. Developing a mentoring process with current leadership is a way to create discussion and a shared language of work between the leadership participants and those doing the work. Bringing the leadership development to a practical level placing the focus on what matters; seeing the work get done and having the opportunity to ask questions, and have someone with skilled-knowledge answer those questions. Combined elements of leadership development, leadership mentoring, individual coaching, and team building into one process. The length of the each person’s leadership education time in the process varied. They were involved until they were identified as reaching capacity, having mastery of the skilled-knowledge areas, and had the ability to fill management and individual contributor positions. Strategy within leadership development is a focus on the whole of the organization and using systems-thinking to see how the whole is greater than the sum of its parts. The Executive Leadership is a large part of determining the needed Skilled-Knowledge and working to identify through the Talent Pool Assessment the vacancies, strengths, and gaps that are projected over the next 3, 5, 10 and 15 years. Involving the executive management team will ensure that the mentoring and development are a part of the Organizational Metrics, using criteria in the shared strategy and skilled-knowledge. Also, that these would be part of the monthly, quarterly, six month and yearly performance reviews. Provide opportunities to lead and learn from the experience. Work with the participants and the management team to develop a series of team projects that are aligned with the companies strategic plan and offer a sufficient challenge that is big enough to stretch and small enough to learn from. 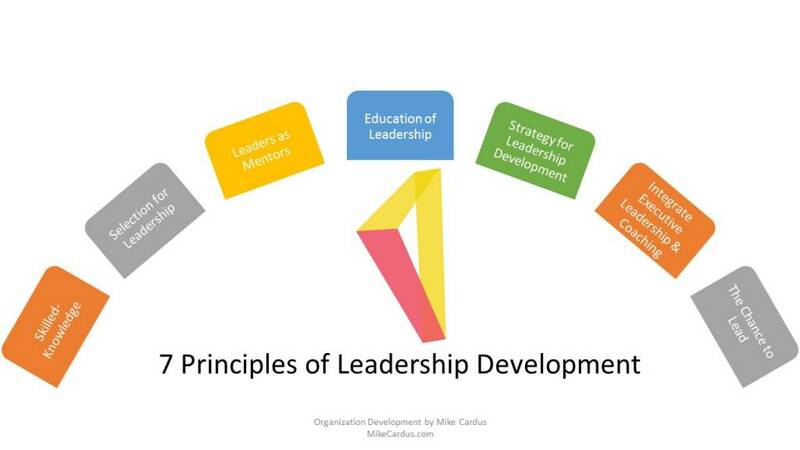 When these leadership development principles are set as boundaries and discussion points, the team can focus on how to achieve sustainable improvement of the organization.